The burning question in the back of my mind was, where were we, and whose house was this? 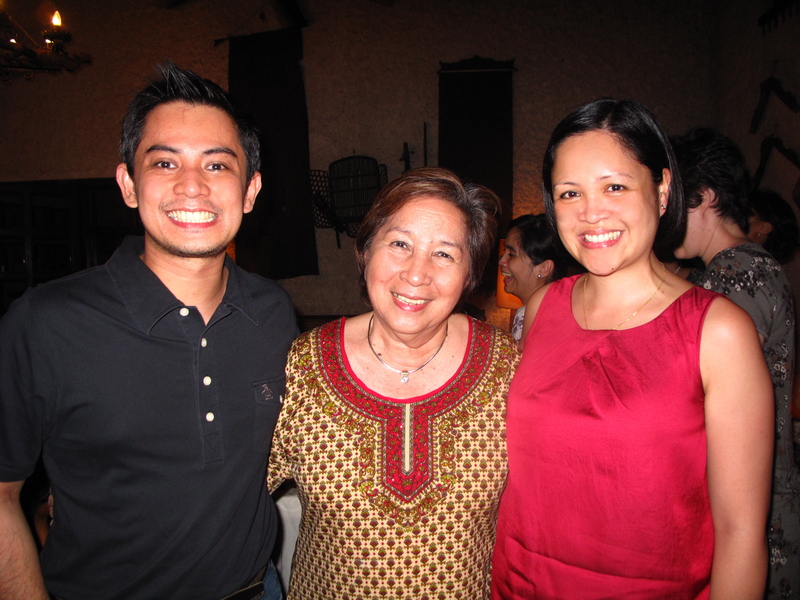 I didn’t have to wonder for long as the evening’s host soon made her grand entrance… It was Winnie Monsod–or more popularly known as “Mareng Winnie”! Apparently, there was a backstory to the choice of location. 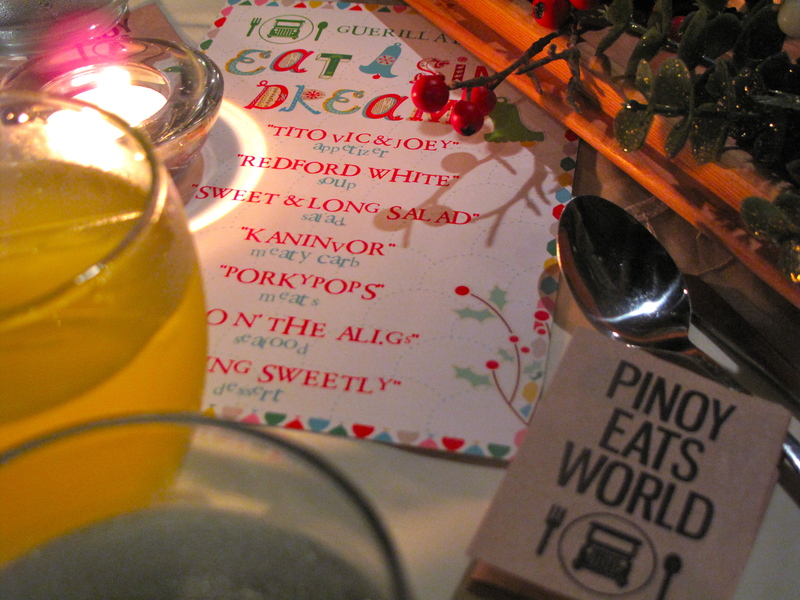 Remember how I mentioned that the guerilla dinner was titled, “Eat.Sing.Dream”? Well, we were supposed to be brought to an orphanage for boys in Pasay City called Bahay Pangarap (putting two and two together, this was the “Dream” part of the title–so I guess I was kinda right :)). But because of the horrendous traffic and the unpredictable weather, there was a last minute change of plans, and the Monsod’s generously opened their homes as an alternate venue. A representative from Pangarap Foundation, Brother Francisco, was instead invited to join the dinner and receive the donation on behalf of his charity. The dinner started shortly with drinks and appetizers served first. For refreshments, there was a choice of calamansi juice or dalandan. I had the former, while the H had the latter. Next up were the appetizers–a trio called Tito, Vic, and Joey. 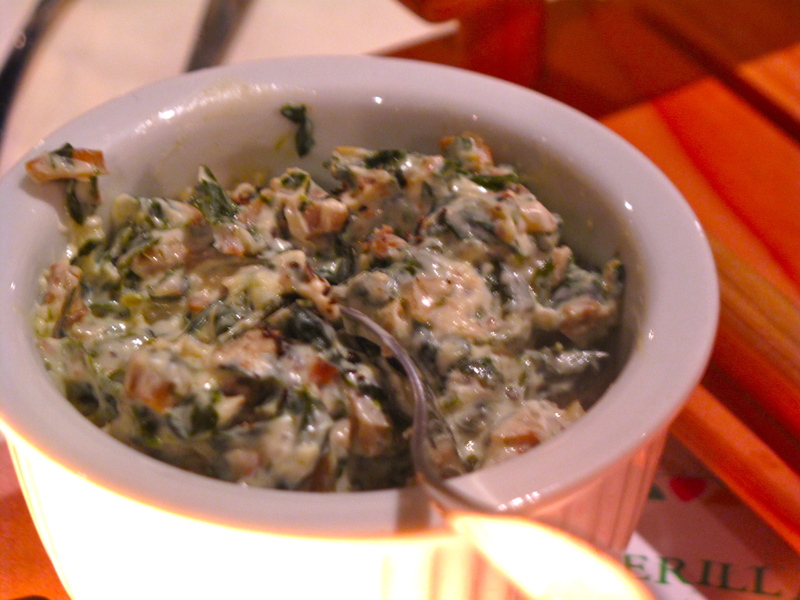 “Tito” was a special kangkong dip served with slices of melba toast. It was yummy! We were definitely off to a great start :). 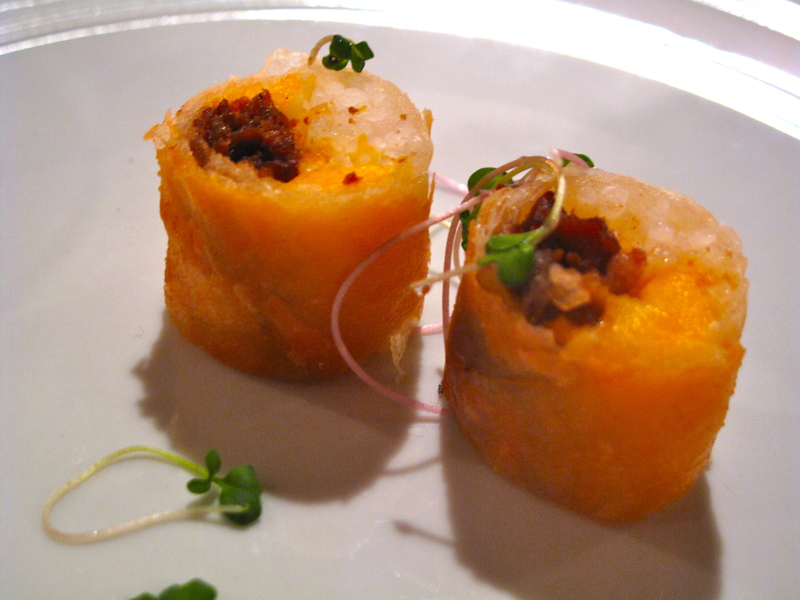 “Vic” turned out to be PEW’s take on a thai spring roll. It was stuffed with something that tasted like bacon, rice and cheese, and came with a vinegar-y sauce. I couldn’t help it, but I had several of these :P.
“Joey” ended up making his appearance later on the evening so I’ll come back to that later. In the meantime, our soup, entitled Redford White, was served. 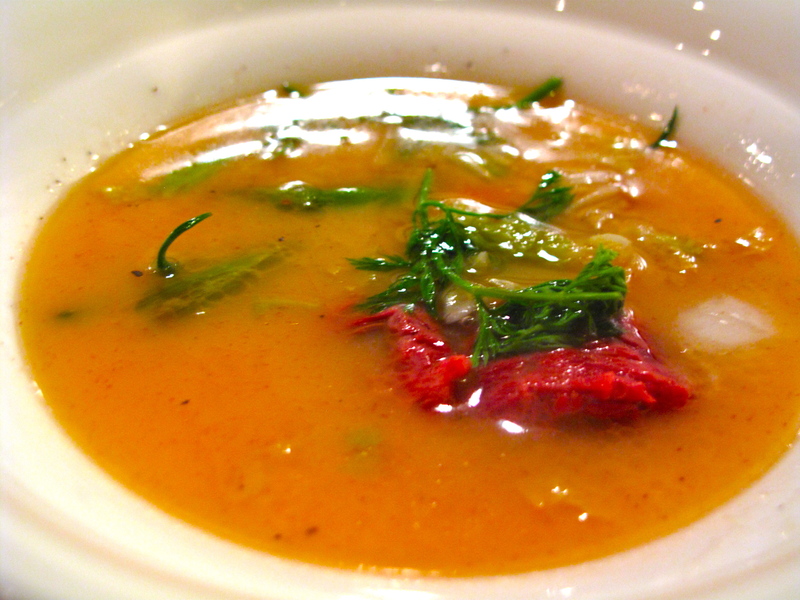 It is again, PEW’s version of cocido, a special sopas that is usually part of many Filipino family Christmas menus. This was one of my favorites of the evening 🙂 The broth was extremely flavorful, the meat soft and tender. I also loved that they put noodles in it! It reminded me a lot of my lola’s chicken sopas and all the fuzzy feelings that it always manages to conjure up:). At this point, though, I was already starting to get full so I had to refrain from getting seconds :(. There were still several dishes waiting to make their appearance, so I knew pacing myself was crucial. As I was spooning the last bit of soup into my mouth, I noticed some people assembling at the front of the room. It looked like the entertainment was about to begin! To my surprise, as one of the singers started to sing, so did the person right next to me! She stood up and made her way to the front, as did the other singers who were, unbeknownst to us guests, “planted” at each table! 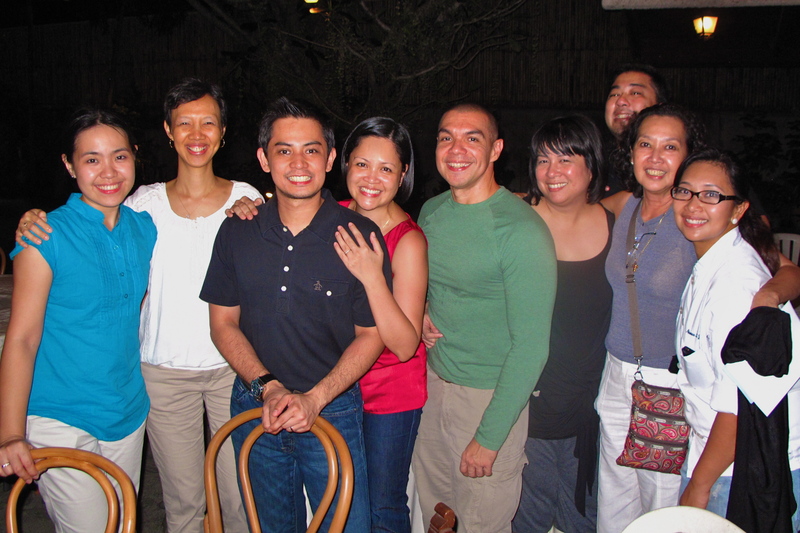 We thought they were dinner guests like us, but instead, they were the entertainment of the evening pala! This was the “Sing” part of the dinner theme. How clever! 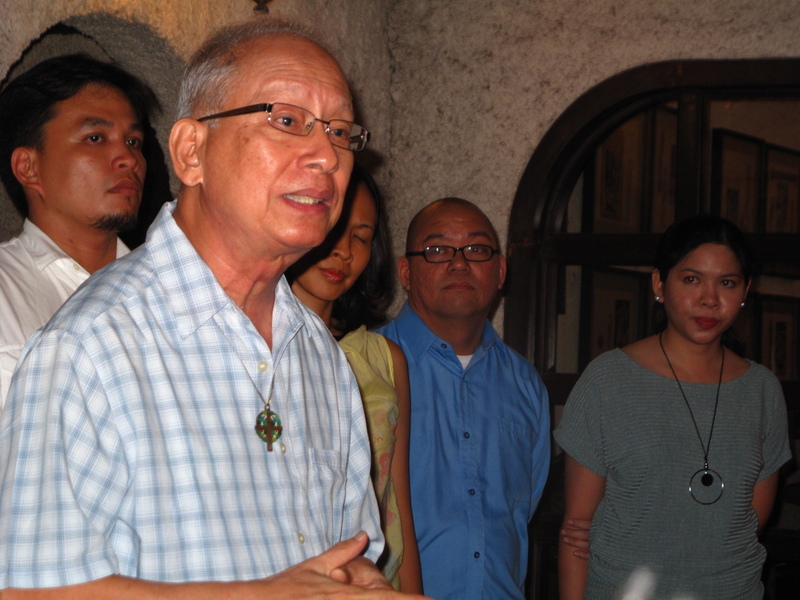 The singers are part of the group called Hangad. 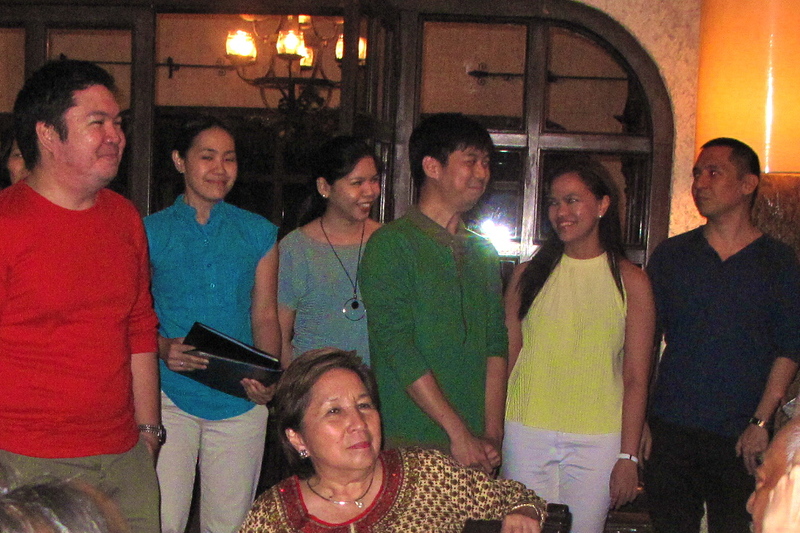 They were specially invited to serenade us throughout the evening with Christmas carols. They were soooo good! Their songs made me remember what I love so much about Filipino Christmases :). "Isang dalagang naglilihi...batang lalaki ang sanggol...tatawagin syang Emmanuel..."
Next up were two courses that were, funnily enough, on opposite ends of the “healthy foods” spectrum–salad and lechon! Haha! 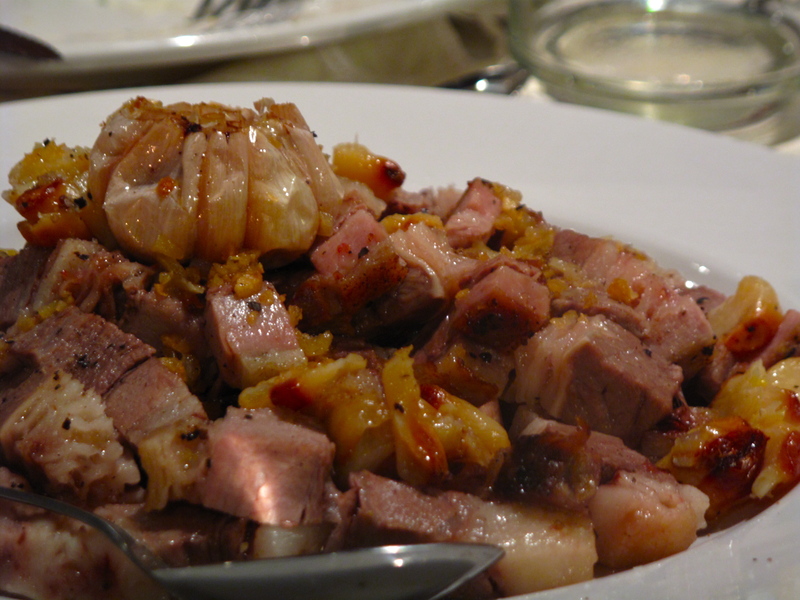 According to the food connoisseurs at our table, the lechon was Cebu lechon. I was excited to give this a try since I have never tasted Cebu lechon, although I’ve been hearing raves about it. This was a very dangerous dish! Haha! 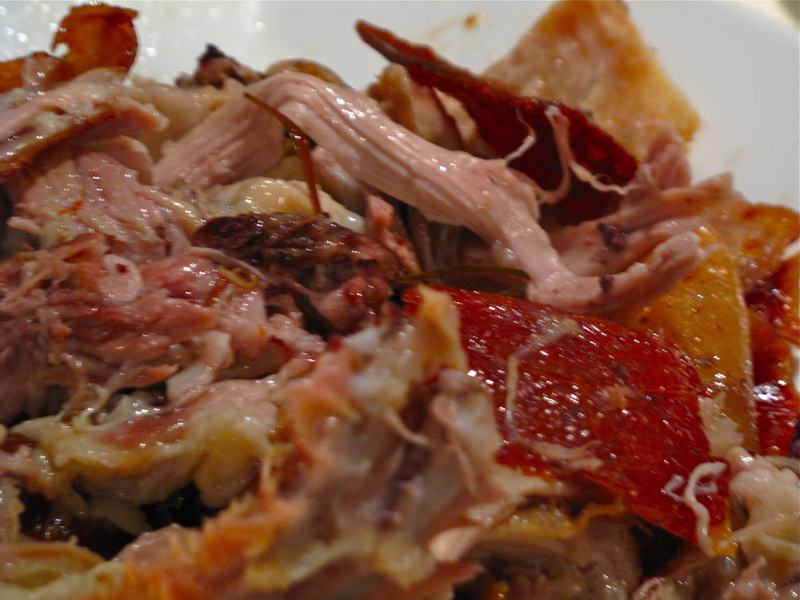 The skin was extremely crunchy–just the way I like it :). The meat was also very soft and nicely flavored–no need for sauce! I made sure to balance the “evil-ness” of the lechon with an equal serving of the salad (although it was not exactly as healthy as I was hoping it to be :P). 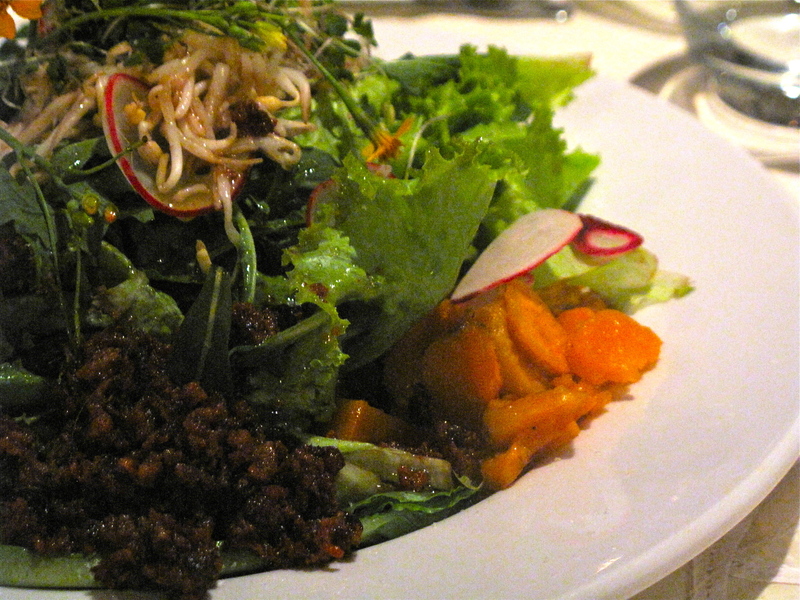 The salad was a mixture of crisp green lettuce, arugula, bean sprouts, beets and kamote. So far so healthy, right? Fortunately or unfortunately, it was accompanied by some longganisang durog–a wonderful and unexpected addition to the salad, but not your healthiest of toppings–haha! Following the salad were three more dishes–a steak salpicao, prawns on a bed of crispy vermicelli noodles with aligue sauce, and finally, “Joey” made his special appearance as well! This dish was playfully named, Hipo N the Ali G's, after a fictional band. 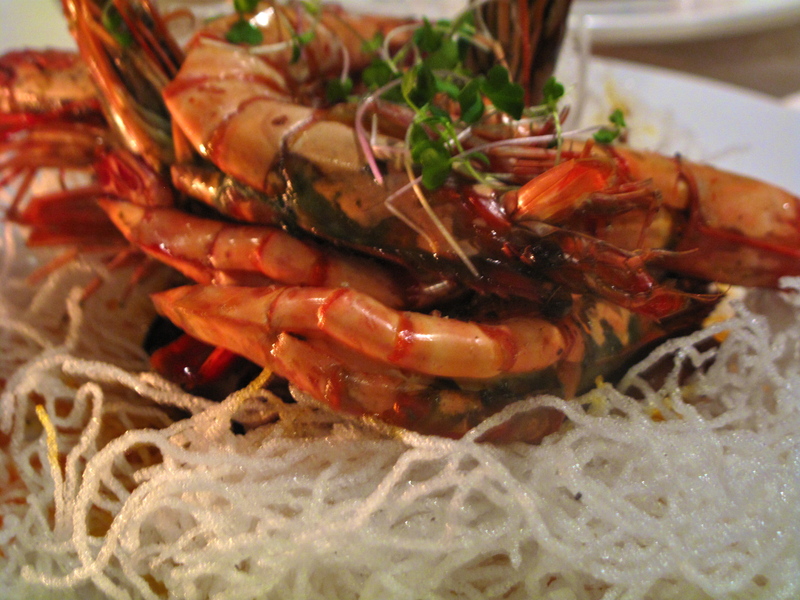 It's actually just prawn on vermicelli with aligue sauce. Haha! “Joey” turned out to be balls of foie gras enveloped in a cloud of Kopiko-flavored cotton candy! 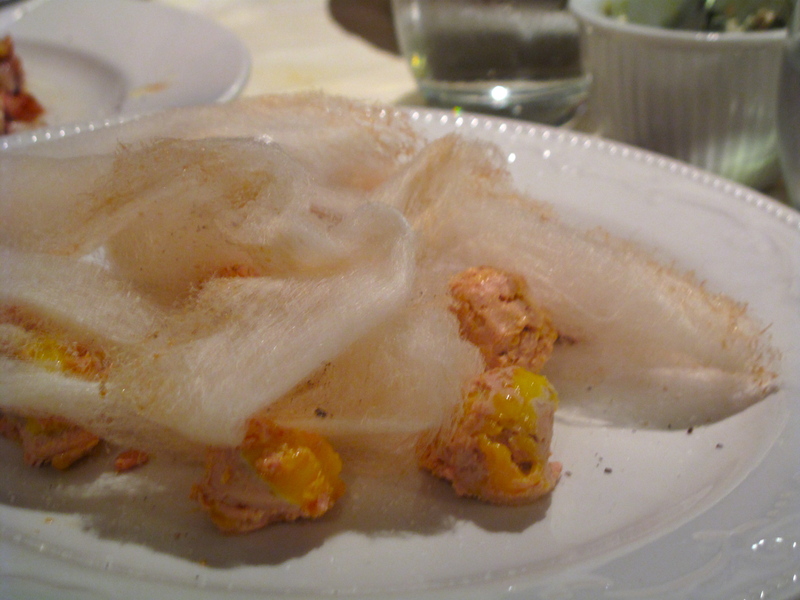 The sweetness of the cotton candy perfectly balanced the creamy saltiness of the foie gras. But oh my, how truly rich this was! I could somehow imagine my arteries waving a red flag of protest already–hahaha! Sadly, we were coming to the end of our meal. While I could honestly not accommodate any more food in my overstretched tummy, I also could not say “no” to the plate of sweets that was laid in front of me. 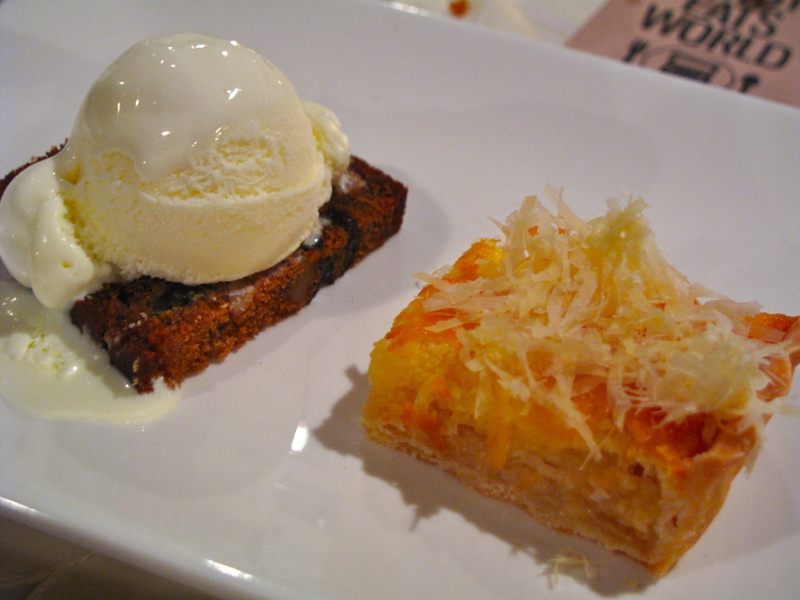 Very simply, the dessert was a scoop of vanilla ice cream over some fruit cake, and another pastry which closely resembled cassava cake with quezo de bola shavings on top. As corny as it sounds, it was the perfect way to cap off a perfectly fun and interesting evening :). The verdict? 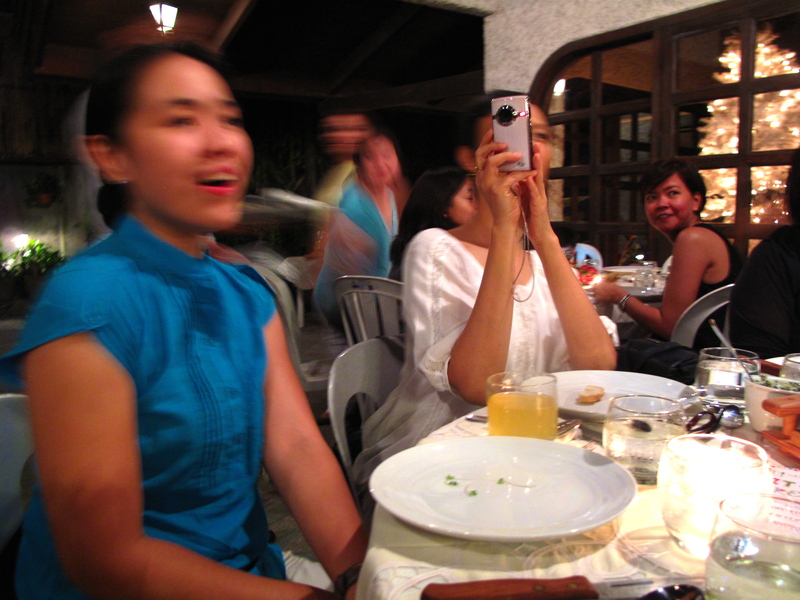 I would totally sign up for another guerilla dinner–in fact, I can’t wait for the next one! 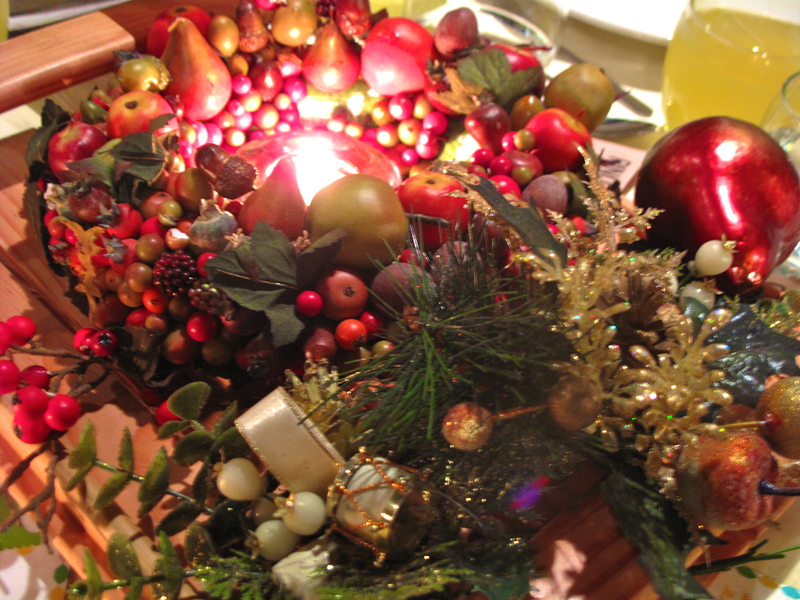 To be able to eat good food, meet new people, while at the same time supporting a charity–now that’s my kind of thing!!! This was truly a great way to make the most of the H’s and my “night off”. Haha! I will end this post with images of the rest of the evening. Hope you enjoyed this post, as much as I enjoyed writing it! 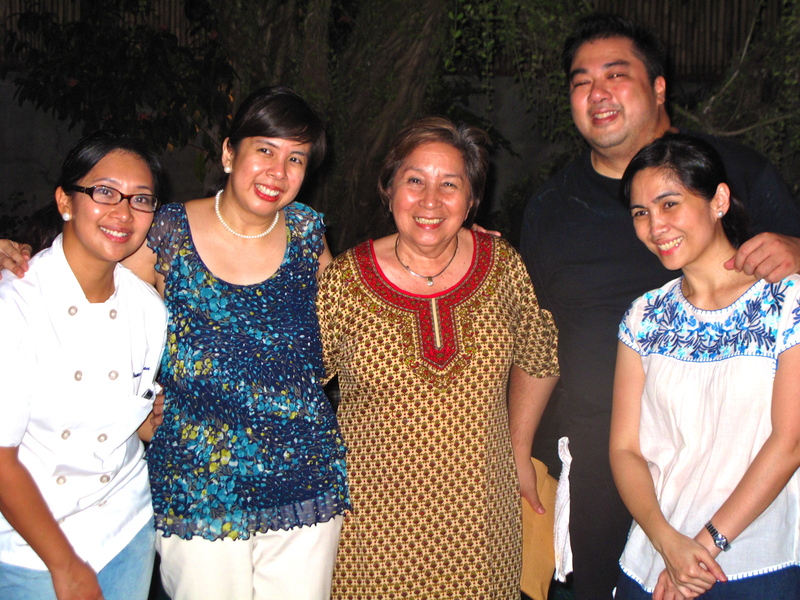 This entry was posted in Food, Social Responsibility and tagged Bahay Pangarap, Cebu lechon, Guerilla Dinner, It, JJ Yulo, Namee Jorolan, Pinoy Eats World, Redford White, Tito Vic and Joey. Bookmark the permalink.